So, the Candian team is ?????????? I could tell you but then I'd have to k.... oh, never mind. Hopefully we'll all find out tomorrow. Yizek......team that was tried in Richmond, probably to give Armstrong a look at Yizek. Have you talked to Coach Rae? Or Wendy? I guess Angie has pissed somebody off! Don't be any good at anything and pissed off the coaches, nice to see the same things happen elsewhere as it does here. 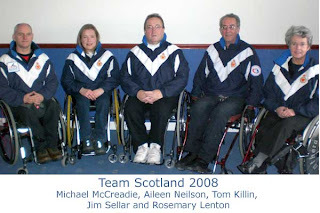 Angie Malone, who played lead on the silver medal team in Torino, has been facing some health challenges which may have affected her status with the British Paralympic program though I do not know that as a fact. She did, however, skip the winning team at the British Open at the end of November - see blog post for November 30. What's with every thread about Armstrong? Calls to the eight candidates are in the process of being made and not everyone has been contacted as of early Thursday morning, so no announcement until that happens.